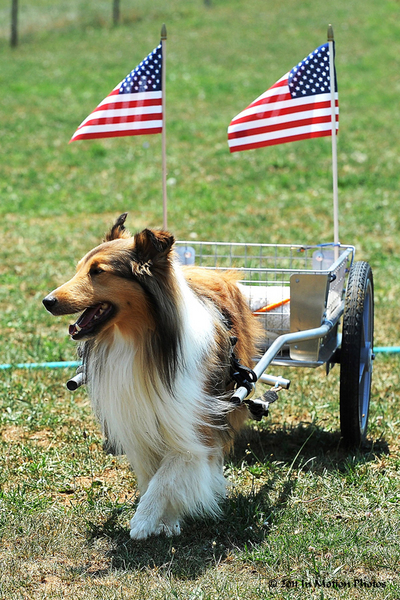 Photo Gallery | CUSTOM DOG CARTS | Manufacturing and selling the finest dog carts for draft dog competition and recreation. We are located in the San Diego, California area and ship carts domestically and internationally. 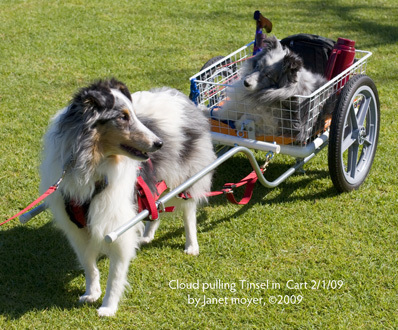 After retiring Cloud, one of our Shelties, from sheep herding (due to injury) he still needed a job. Cloud's first lesson was on a driving sulky (a two wheeled cart on which people ride). This was too tall and too heavy for him. Nonetheless, he loved carting from the first lesson. So we began making our own carts and providing them to other people who wanted to join in the fun. People often stop us when we are carting and ask, "Why do you do this, what good is it?" Our carts are designed to fit many different breeds (small to giant) and we will be happy to discuss your dog’s requirements. Carting is fun for the dog and the handler and provides gentle exercise for both. Come join the fun!